Welcome to ASBO New York's State Budget information page. ASBO analyses and materials related to the state budget will be posted here. For past years' budget information, click here. On Friday evening, Governor Cuomo signed the 2019-20 state budget. 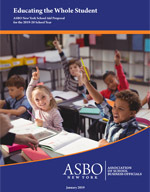 None of his line-item vetoes addressed public education, so all aspects of the budget covered in ASBO updates and our recent webinar will go into effect. In particular, school districts can establish TRS reserves. Unfortunately, the Governor didn’t take action to address the burden school districts will face because of changes to the election law authorizing employees to take up to three hours off with pay to vote. Attached is a sample letter you can share with your legislators outlining these challenges and asking for school districts to be exempted from the law. As in past years, we created a data table showing comparisons of various state aid categories from last year to this year. Please use the dropdown menu on the page to search and select your district. Click here to download the sample resolution. Click here to view the TRS Sub-Fund Q&A. We hosted a webinar to present the 2019-20 New York State budget relating to education and its effect on school districts on Thursday (4/4) at 2 p.m. Slides from the webinar can be found here. Download and view the webinar here. Along with all of the good news, there are some challenges in the budget. While we appreciate the significant Foundation Aid increase over the Executive Budget proposal, it is a smaller percentage increase than last year and doesn’t represent a significant step toward fully funding Foundation Aid, leaving many school districts without adequate funding to provide all students with the opportunity for a meaningful education. The budget also made the Tax Cap permanent without modification. School Aid runs for the 2019-20 school year are now available and can be viewed here. Both houses of the Legislature released their one-house budget bills this week. These are often seen as legislative wish lists and are unlikely to make it into law as is but form the basis for serious negotiations between the Governor and the two houses. The legislative budget bills included many proposals advanced by ASBO New York. Modify the Executive proposal allowing school districts to purchase school bus stop arm cameras, to require such cameras be reimbursable through state aid. Building Aid for lead testing and periodic inspections required by the Commissioner. Below is an updated comparison chart showing elements of proposals by the Executive, the Legislature, and ASBO. Rejects executive proposals for equity plans, services aid and a new tier of building aid. Proposals include equity in small city debt limits, excluding local share of BOCES capital projects, and include PILOTs, TRS reserves, transportation flexibility incentives including piggybacking on existing contracts, staggered building condition surveys, and amnesty for Building Aid penalties resulting from administrative errors. Both reject Executive proposals on equity plans and repeal school-level budget reporting requirements, reject changes to categorical aids (changes to building aid and services aid block grant). Both include TRS Reserves, five-year staggered building condition surveys, and using building aid to finance tax certiorari. Both propose raising the salary cap for BOCES District Superintendents. Assembly proposes a new homeless student aid and piggybacking on transportation existing contracts. Senate includes amnesty for Building and Transportation aids. Major proposals include: equity plan mandate addressing intra-district aid distribution, consolidating 11 aid categories into a block grant, and significant changes to formula aid, new tier of building aid. Our team analyzed the governor's Services Aid proposal and found that it would result in substantial cuts to state aid for many school districts. We also analyzed the Building Aid portion of the executive budget and demonstrated that the governor's proposal would reduce state spending on building aid by shifting the burden to local taxpayers. The Governor released 30-day amendments relating to P-12 education late on February 14, 2019. The Governor’s proposal continues to exempt school aid from budget reductions that may occur if state revenue is low. School aid may be affected if federal funding is reduced by at least $850 million. Legislative action outside the budget process can have no significant fiscal impact without a process to identify funding. The Executive’s Budget amendments introduced “pay-go” language to provide for the offset, through spending reductions and/or receipts increases, of bills that are adopted outside of the Budget and have a fiscal impact of at least $1 million. The Legislature could still act on bills with a significant fiscal impact; the language just ensures that there is a plan in place to maintain Budget balance. Equity plan legislation, if enacted, will occur regardless of any reductions that occur if revenue is low. An assortment of different competitive grants awarded since 2012 are re-appropriated and extended to March 31, 2020, correcting an oversight by updating the special lapse date embedded in the appropriation language (currently 3/31/19). Read our summary of changes, along with descriptions released by the New York State Budget Division and links to bill language. Michael Borges, Executive Director, offered testimony to New York's joint legislative body on February 6, 2019. In his testimony, which can be found here, he outlined the need for critical changes to the Executive's proposal which lacks a meaningful commitment to fully fund Foundation Aid owed to school districts among other shortcomings. Read the full testimony here and view the testimony below. On February 8, 2019, Deborah Cunningham, Director of Education and Research, presented an Updated Executive Budget Analysis to ASBO's Capital chapter. On January 15, The Governor presented his Executive Budget. In it he called for a 3.6 percent increase in education aid for a total funding level of $27.7 billion in state aid to school districts. Slide 22 referenced the 2020-21 school year. It should have referred to the 2019-20 school year. Slide 24 said the new Services Aid would have a "minimum one percent increase." That should have been "a minimum of no increase." A new slide 25 has been added describing provisions relating to a new tier of state Building Aid beginning in 2020-21. Click here to view the full proposal. Equity index mandate addressing intradistrict aid distribution, significant changes to formula aid, new form of building aid. Equity in small city debt limits, exclude local share of BOCES capital projects in Tax Cap, TRS reserve, transportation flexibility incentives, etc.